Learn to Embroider Kit includes all 3 Designs! 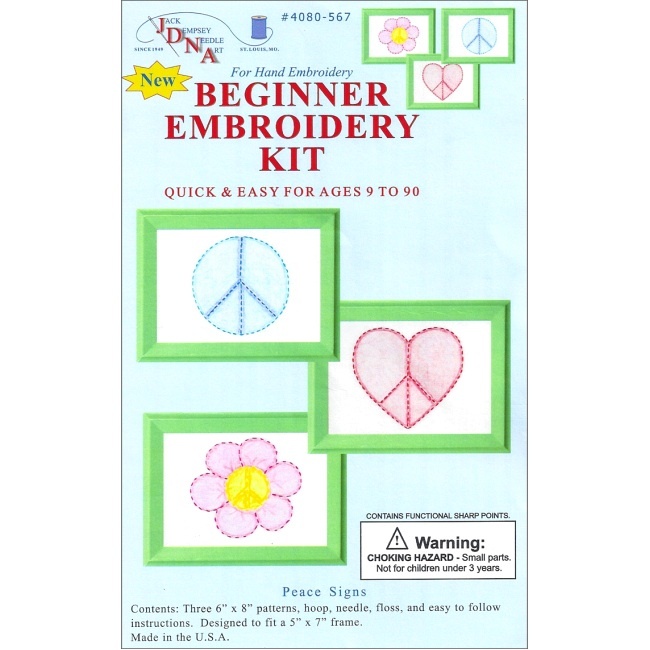 The Peace Signs Beginner Embroidery Kit is a complete embroidery kit for children 8 years and above. This kid's embroidery kit includes three 6" x 8" patterns printed on fabric, embroidery hoop, embroidery floss, needle, and detailed instructions. Optional finishing step includes using crayons to color in the embroidered designs (as shown in photo). Your completed embroidery work will be ready for framing. This is a quick and easy embroidery kit for teaching children how to embroider! Designed to fit a 5" x 7" frame (not included in kit). This kit is recommended for ages 8 and above.